So…I’m kind of a technophobe. I know, I know. It goes against every geekery bone in my body. Tech is wonderful, I’ll admit, but I find most electronic gadgetry (except power tools, which are like my candy) intimidating and I really don’t like change. I’ve had the same cell phone for approximately five years. I loved it so much it had duct tape on the back cover to keep it from falling off and I’d ordered extra batteries for it (WHICH SUCKED, BY THE WAY, AND DIDN’T DO THEIR JOB, JUST SAYIN’, ELECTRONICS STORE PEOPLE!) to keep it alive another year when it wouldn’t hold a charge anymore. It was what I called a “dumbphone” (as opposed to you kids and your newfangled “smartphones”) and I liked it that way. No, I didn’t need a camera or to check my email or do anything but TALK ON THE PHONE. That’s what I wanted. A PHONE. Not a friggin’ handheld laptop. But alas, Luddite tendencies or no, change is inevitable and one must evolve. So, when my dumbphone finally rang its last, I gave in and got one of them newfangled smarty-phones the kids all have. Remember last week or so when I was talking on Twitter about cooking a vegan casserole? Yeah. That. I have this vegan friend (okay, I have a surprising amount of vegan friends for an omnivore), and we’ve been doing a dinner thing once a week or so. 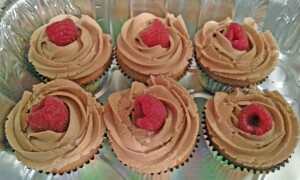 I’ve been trying my hand at vegan cookery, and she rewards my efforts with the most delicious vegan desserts. 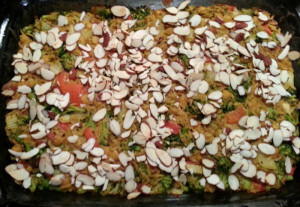 The above was last week’s effort – Creamy Vegan Broccoli and Rice Casserole. It was actually edible and surprisingly good. 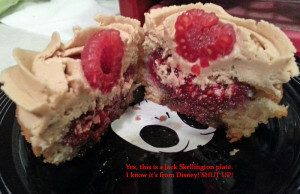 So good, in fact, that I’ll make it again, nutritional yeast and all. Cupcake insides. Made by Lovely Vegan Friend. Yeah. I ate two. In a row. DON’T JUDGE ME. Also, there is apparently a show called Cupcake Wars, but being a person who does not have (and despises) television, I was unaware of this. This recipe apparently won the show or something. I can see why! My pets all love them. 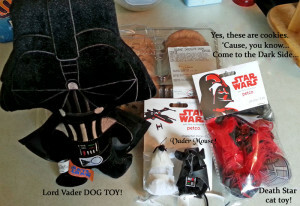 Pup especially loves his Lord Vader toy. While it is demeaning to the Dark Lord to squeak, it is tremendously entertaining. That can’t be comfortable. Little Broken Cat and her face against the wall. For those who don’t know, I moved my office this summer. I’m in what used to be the master bedroom. The wallpaper in here is very likely older than I am (or nearly so) and it needs removing and the walls painting. The guest bed has been moved in here and is a favorite place of the furbrats to nap, though generally not in such a position. So, a pic was in order, and since I can’t find my actual camera and NH was at hand…well…there you go. Thus ends the saga of Dina and The New Hotness. Now that I know how to get pics off it, I’m sure more will be forthcoming. Maybe. This entry was posted in Uncategorized and tagged dina in the kitchen, dina leaves the lair, pic!spam, tres domestique by Dina. Bookmark the permalink.